While the rebound in retail sales was welcome (if modest) after several months of missing analyst expectations, China's fixed investment - historically the biggest driver behind the economy - rose at the lowest pace on record. This was offset by another drop in car sales, while jewelry demand rose 14.1%. 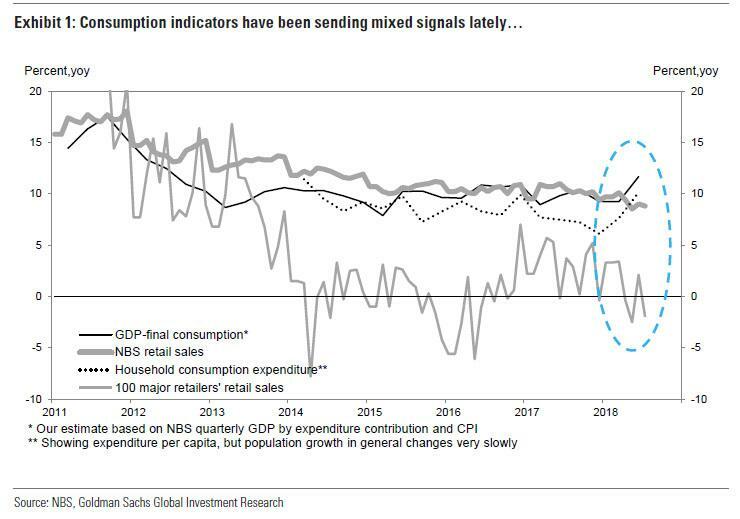 While some have praised the beat in retail sales, recall that over the weekend Goldman showed the wide divergence between public (strong) and private (weak) consumption data, suggesting that Beijing is goalseeking yet another data set in addition to GDP. That said, the latest drop in fixed investment - potentially a consequence of the trade war with the US and China's own shadow deleveraging - will probably mean more pressure on the government to push growth, meaning more fiscal stimulus. In fact, the record low fixed investment suggests that contrary to the trade war rhetoric, China's growth woes are homegrown, not just the trade tensions. And, as we have discussed previously, the ongoing sharp decline in investment spending by local governments due to develeraging campaign may be to blame. Commenting on the data, Tring Nguyen of Natixis, summarized that "retail sales up but fixed asset investment down again. Not great news for growth expectations & growth is increasingly more dependent on consumption. So what is the reaction from the government? More pump priming? 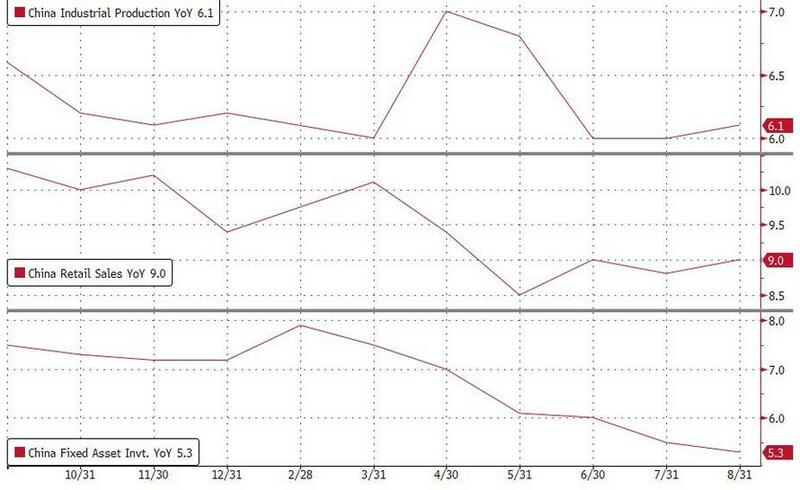 The worse the data, the more the easing?" #China : Retail sales up by fixed asset investment down again. Not great news for growth expectations & growth is increasingly more dependent on consumption. So what is the reaction from the government? Meanwhile, as Bloomberg also notes, an August jump in local government bond sales from a year ago may be a signal that China's infrastructure projects are kicking off again to support a wilting economy which has been hit by the twin risks of trade wars and deleveraging. Maybe, but for now China's modest slowdown is a sharp contrast to the sharp uptick up in U.S. growth, which has helped to explain why Chinese stocks have fallen into a bear market while the U.S. has hit record highs, and why Trump continues to press China on trade concessions: after all he is confident that the US is winning the trade war. Ultimately, the biggest risk to China is whether the ongoing slump in the credit impulse accelerates. 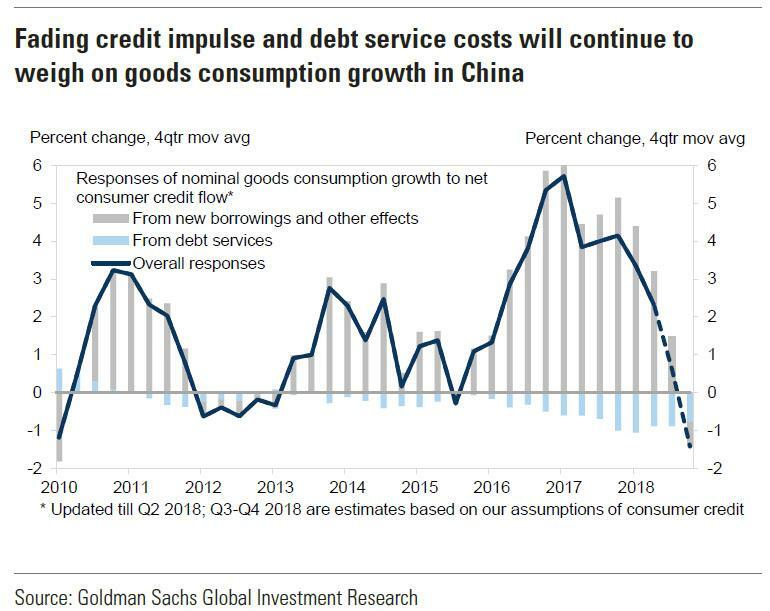 And if Goldman's forecast is correct, and the credit impulse is about to plummet, China is about to unleash the biggest global recession since the financial crisis.